The historic center of Querétaro has been declared a World Heritage Site by UNESCO. Most historic and cultural attractions are located in the capital. Another major attraction is its 74-arched aqueduct built in the early 1700s. 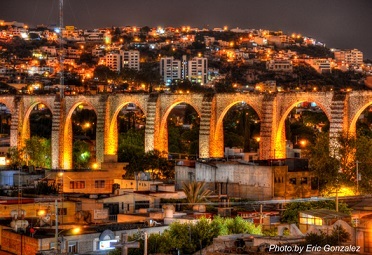 The aqueduct rises 23 meters (75 ft) above street level and conveyed drinking water to the city from regional springs until 1970. The founding of the city of Querétaro is celebrated in July with various cultural and gastronomic events. Conchero dancers go in procession to the La Cruz Church to commemorate the appearance of Saint James. Also, you can enjoy the Wine Route. This connects three major wineries, Freixenet, La Redonda and Los Aztecas, along with various cheese producing facilities and some small towns chosen for their charm, such as Tequisquiapan and Bernal. Querétaro has one Pueblo Mágico, San Sebastián Bernal. 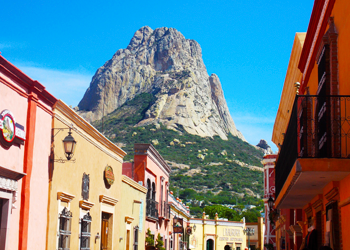 Located 57 km from the state of Querétaro, It is best known as the “Peña de Bernal”, and is the third largest monolith in the world (is 433 m (1,421 ft) tall) after the Rock of Gibraltar and Sugarloaf Mountain in Río de Janeiro. It was considered sacred by the Chichimeca and dates back to the Jurassic Period more than 100 million years ago. The climb to the top of the Peña de Bernal is not easy, although there is defined path, the last stretch of about 45 meters, is vertical. There in that stretch, rods shaped staples, nailed to the wall as a nautical ladder. For the type of stone and the possibilities it offers, the Peña de Bernal is an attractive national and international level for practicing rock climbing. The center of the town has cobblestone streets, traditional rustic houses with wrought iron fixtures, balconies, and wooden windowsills, which is the legacy of its 300-year heritage as a colonial town populated mostly by indigenous people. 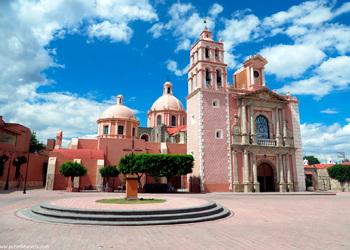 The town of Tequisquiapan in southwestern Querétaro is a tourist town. The center of the town has cobblestone streets, traditional rustic houses with wrought iron fixtures, balconies, and wooden windowsills, which is the legacy of its 300-year heritage as a colonial town populated mostly by indigenous people. This, the climate, and the local natural water springs have made the town a popular weekend getaway for cities such as Querétaro and Mexico City.